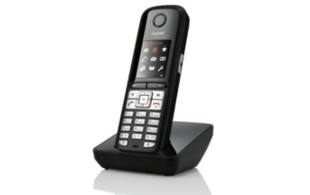 DECT is the global standard for cordless telephones, delivering enhanced audio quality and advanced features. 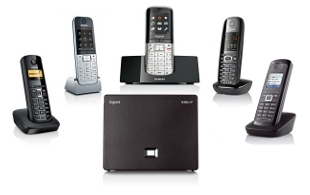 To use DECT, you need a base station plus one or more handsets. In theory all DECT handsets should be compatible with all base stations, regardless of manufacturer, however we generally recommend purchasing base stations and handsets from the same manufacturer, to minimise the risk of encountering any incompatibility issues in extended features. 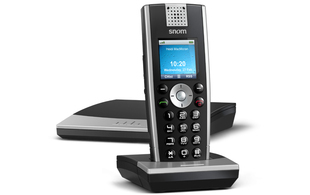 We stock DECT handsets and base stations by Snom, Gigaset, and Yealink. Click maker's name to go direct to their section. The Snom m9r is the next generation DECT handheld that empowers users with the convenience of wireless communication along with the widely accepted benefits and feature richness of Voice-over-IP telephony. The snom m9r promises to deliver excellent speech quality. 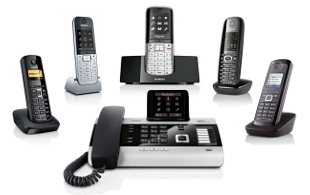 Connect up to 6 DECT handsets there is a from robust to luxury. This means that this is a great business telephone solution for up to 7 users. Extend the DECT range by adding the RTX 4002. You can extend the DECT operational range (Up to 6 can be added). The Gigaset N300 IP is the easy-to-configure hybrid DECT IP base station that lets users enjoy calling over both a landline and the internet. Multi-line support allows registration of up to 6 different compatible Gigaset handsets to the base station and up to 4 parallel calls (1 landline + 3 VoIP) can be made at once. All VoIP calls are in HD sound thanks to exceptional HDSP. technology. 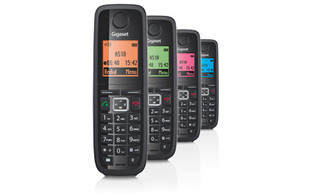 Energy-saving2 ECO DECT means that the Gigaset N300 IP is eco-conscious as well as hi-tech. Enhance your Gigaset phone with the stylish Gigaset A510H, the best-value handset that fuses attractive form and essential functions. Its 1.8. display, illuminated by a backlight, is easy to read and navigate. There are 4 different colour backlights to choose from . allowing you to select the look you prefer. Conversations are a pleasure on the Gigaset A510H, reaching you in brilliant HSPTM sound quality. Easily adjust the volume while you talk in hands-free mode. You also save energy with the Gigaset A510H, which offers a low power consumption of <0.4W as well as ECO Mode Plus with no radiation. For an extra handset with practical functions and high-quality design, discover the Gigaset A510H. 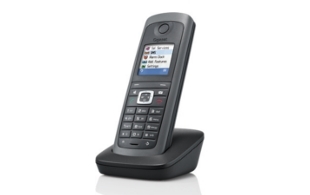 The reliable DECT handset for professional use. The R410H PRO is designed for use in tough environments. Equipped with a splash water and dust protected surface and a shock resistant housing it is perfect for all day use. The R410H PRO is perfect to use with N720 IP PRO, N510 IP PRO and the Gigaset DX800A All-in-one, a hybrid desktop phone. But it can also be connected to all other Gigaset DECT base stations. Zero-touch installation ensures quick and easy configuration. 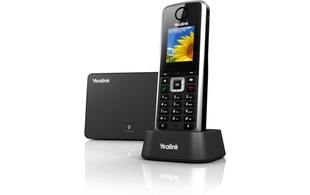 Yealink IP DECT SIP-W52P is a SIP Cordless Phone that.s designed for small business users who are looking for immediate cost savings with scalability and efficiency. The high-quality TFT colour display provides a clear view from all angles and the high definition speaker phone ensures clear handsfree communication. The SIP-W52P supports 4 simultaneous calls per base and offers professional features including intercom, transfer, 3-way conferencing and speed dial. It also works with well known brand platforms including Broadsoft, Asterisk and 3CX and supports quick and easy cofiguration.